A combination of jetlag and innate summer laziness means that I have been very slow to rise while being in Paris. This morning I had to wake up before 11, and I felt the great injustice of it. I actually like the morning, believe it or not, and I can be perky early if need be, but there is nothing as wonderful as sleeping away half of the day and feel that you somehow cheated adulthood out of something. Unfortunately, I also like having enough daylight hours to do things in, and thus sleeping-in inevitably creates a stressful moment later in the day. Not so in Paris. True, it is mostly because I have virtually no agenda to accomplish, but it is also because I had forgotten how deliciously long the days are this far north, how the sun doesn’t fully set till almost 11, and how you are able to treasure ling hours of twilight where you feel free from the day’s stress and not yet burdened by the knowledge that you should be getting sleep. 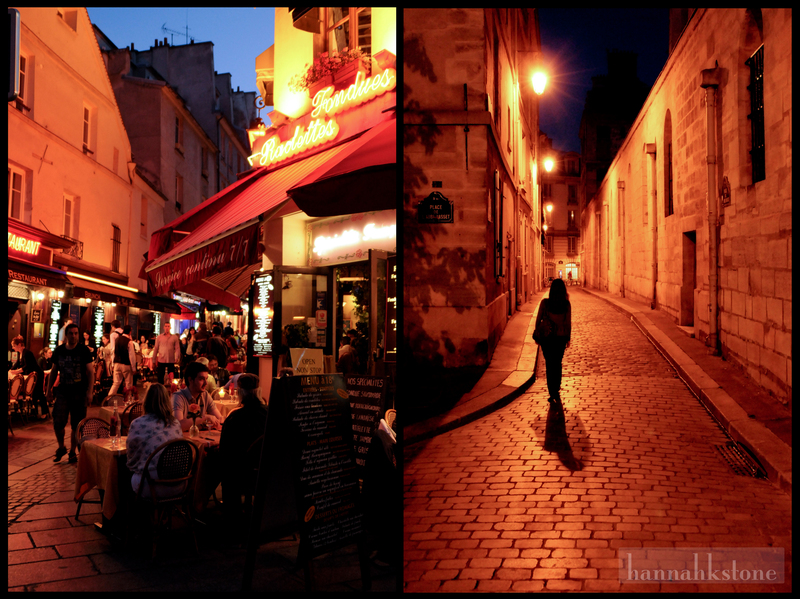 When the sun finally does set, you get the joy of seeing Paris by night, with glowing alleys and streets lit by the lights of bustling restaurants. And it is worth finally relinquishing the daylight for this. This entry was posted in Uncategorized and tagged France, Paris, photography, seasons, summer, travel. Bookmark the permalink.